Llamas do have a funny reputation for spitting, a trait they share with other South American camelids. Thankfully, most llamas are gentle, curious, and well-socialized creatures that rarely spit at humans, normally reserving their spit for members of their own species. Llamas are descended from wild guanaco and were domesticated in the Andean Highlands of Peru some 5,000 years ago. They were vital for pre-Inca civilizations such as the Moche (100 AD to 800 AD) as well as for the Incas themselves, providing fiber, meat, and fertilizer. Llamas were also important beasts of burden in Peru, a country with no other pack animals prior to the arrival of Francisco Pizarro and the Spanish Conquistadors. They can carry 25 to 30 percent of their body weight for five to eight miles but are not ridden except by children. Llamas are still used as pack animals in the Andean Highlands and can pull a small cart if needed. Peruvian craftspeople also use the llama’s soft, warm and luxurious wool for spinning and weaving clothing. Llamas spit as a show of dominance over other llamas. Spitting at a lower-ranked juvenile llama in the herd is also a form of hierarchical discipline. It is especially common when llamas are eating and want to keep others away from their food. A female llama can spit to show a male she's not interested in his mating advances, as well. A llama might also spit when threatened by a predator—a sufficiently vociferous spit attack is sometimes enough to scare off an assailant. Other methods of defense include kicking and charging. If raised correctly, llamas are unlikely to spit at humans unless they feel directly threatened. 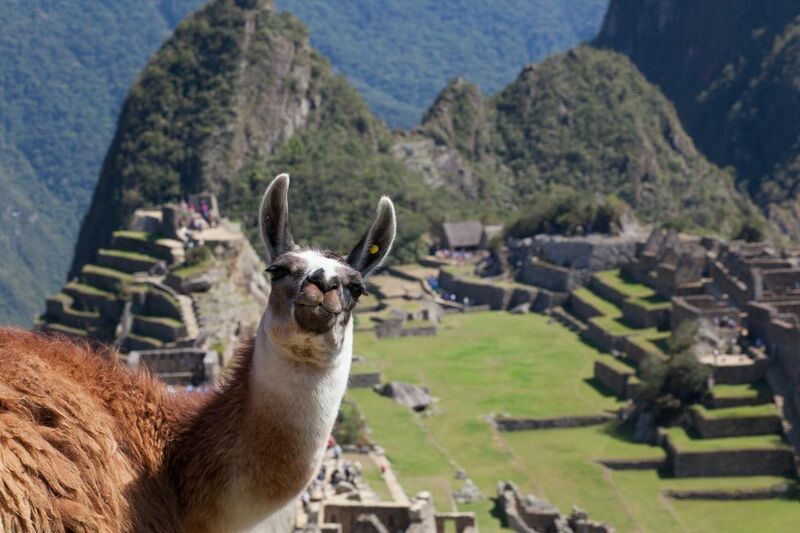 The llamas at Machu Picchu, for example, are generally very well behaved. When raised incorrectly, however, spitting at humans can become far more common. This is either because the llama has been mistreated and no longer trusts humans, or because it has been raised by humans and therefore sees them as part of the herd. If a llama sees you as just another llama, it might want to show you who’s boss. In Peru, there are some llamas that you need to watch out for. These include llamas in zoos, llamas raised by humans without the company of other llamas, and llamas used as photo opportunities to extract money from tourists. For example, llamas with ribbons and bells in their hair might look cute, but they might not be too happy with the whole situation. Basically, if a llama is in a situation where it can get agitated, you may want to watch out for a spit attack. There are different levels of llama spit, ranging from a gentle and almost unnoticeable spray to a sticky concoction raised up from the depths of the most distant stomach compartment. When mildly irked, a llama will spray a simple mist of saliva that packs no real punch. If it happens to be eating at the time, and quite possibly in defense of its food, the llama will spit out the contents of its mouth (sometimes known as grain spit). Things get a lot more disgusting when a llama feels seriously irritated or threatened. When this happens, the llama regurgitates a rancid green fluid from one of its three stomach compartments (the contents of the third compartment is the most potent). This regurgitated spit won’t do you any harm, but it might ruin your day—especially if you’re a long way from the nearest shower or change of clothing. A llama can spit over a distance of about 10 to 15 feet. Even at that range, a llama can spit with surprising accuracy, so don’t drop your guard too quickly or underestimate the llama's aim. There are a few signs to watch out for if you think a llama may spit at you. Before unleashing this green and stinky stomach spit, the llama first pulls its ears back flat against its head, stares at you, then raises its chin and begins to gurgle. Immediately after that, it’s time to duck. If you notice these signs, the wisest course of action is to avoid eye contact and act non-threatening.